Please friend Paul and help get the word out! "Today, Hellyer warns of a hyper-Orwellian New World Order run by banker elites and their masters of war with designs on our personal freedoms. 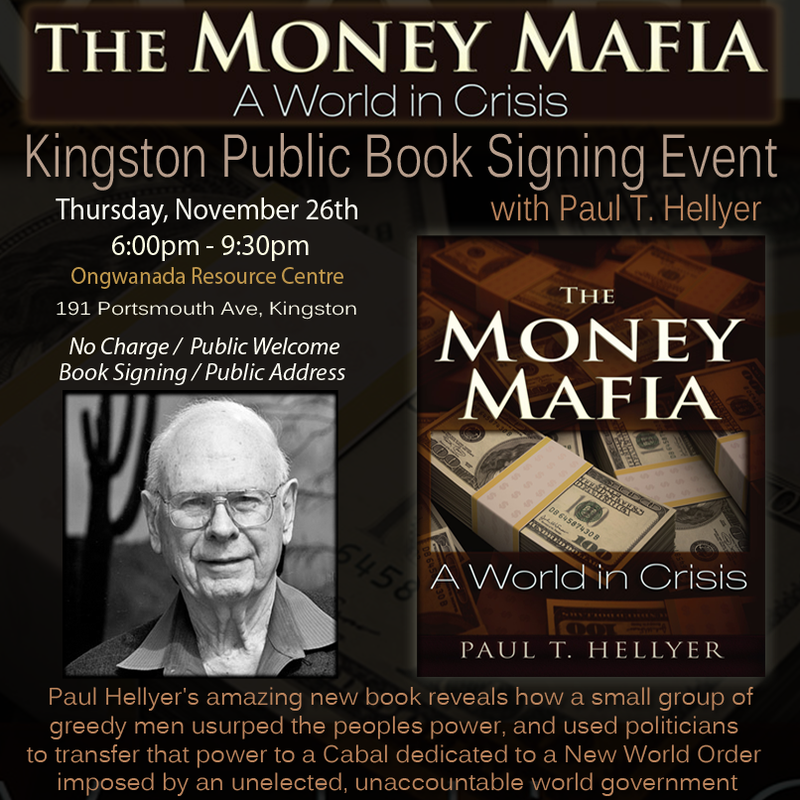 They don't want any change," says Hellyer. He ends with a plea to urge the Harper government and legislators everywhere not to let current free trade agreements go forward. "That is high treason," he fumes. Standing ovation." The Hon. Paul Hellyer will have his new book ﻿'The Money Mafia'﻿ available for purchase and signing. Mr. Hellyer will also deliver a short speech, and take questions from the audience. Ottawa Facebook Event Page - Please visit, join and share in Ottawa and surrounding areas! "Hellyer would make a far better President of the USA than anyone who is likely to run…with the possible exceptions of Gordon Duff, Cynthia Mckinney and Merlin Miller. Buy his book, pass it on to your less-aware friends and family members, and get ready for the coming O.K. Corral style showdown with the NWO. The Hon. Paul Hellyer will have his new book 'The Money Mafia' available for purchase and signing. Mr. Hellyer will also deliver a short speech, and take questions from the audience. Kingston Facebook Event Page - Please visit, join and share in Kingston and surrounding areas! 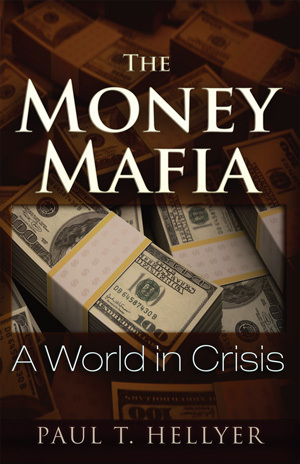 "The root of the problem, according to Hellyer, is that the NWO money mafia has pulled off “the biggest heist in history” by monopolizing the creation of currency, backed by nothing, that is lent into existence at interest. He calls the money masters and their secrecy-driven military-industrial complex “the Cabal” and says it must be overthrown to save humanity and the miraculously biodiverse planet it inhabits." London Facebook Event Page - Please visit, join and share in London and surrounding areas! The Hon. Paul Hellyer will have his new book "The Money Mafia' available for purchase and signing. Mr. Hellyer will also deliver a short speech, and take questions from the audience. Guelph Facebook Event Page - Please visit, join and share in Guelph and surrounding areas! 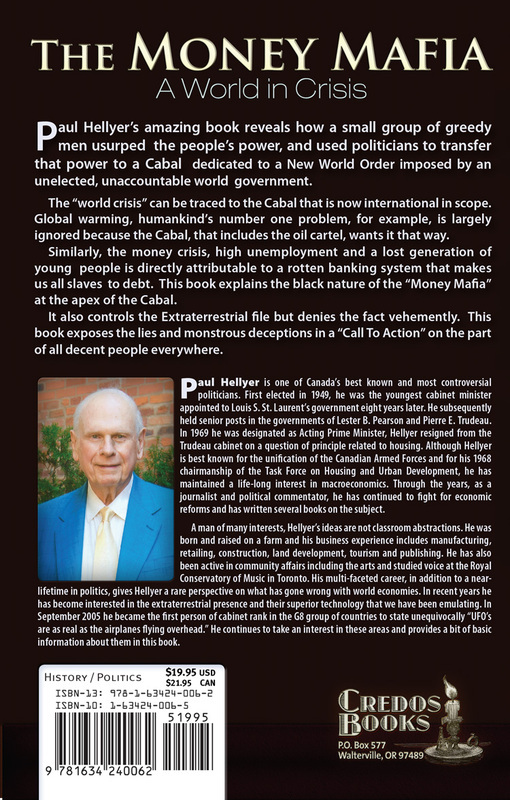 Paul Hellyer's amazing book reveals how a small group of greedy men usurped the peoples power, and used politicians to transfer that power to a Cabal dedicated to a New World Order imposed by an unelected, unaccountable world government. 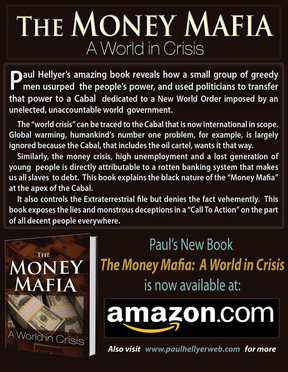 The 'world crisis' can be traced to the Cabal that is now international in scope. Global warming, humankind's number one problem, for example is largely ignored because the Cabal, that includes the oil cartel, wants it that way. Similarly, the money crisis, high unemployment, and a lost generation of young people is directly attributable to a rotten banking system that makes us all slaves to debt. 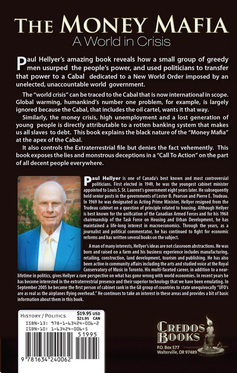 The book explains the black nature of the "Money Mafia" at the apex of the Cabal. It also controls the extraterrestrial file but denies that fact vehemently. This book exposes the lies and monstrous deceptions in a 'Call to Action' on the part of all decent people everywhere. 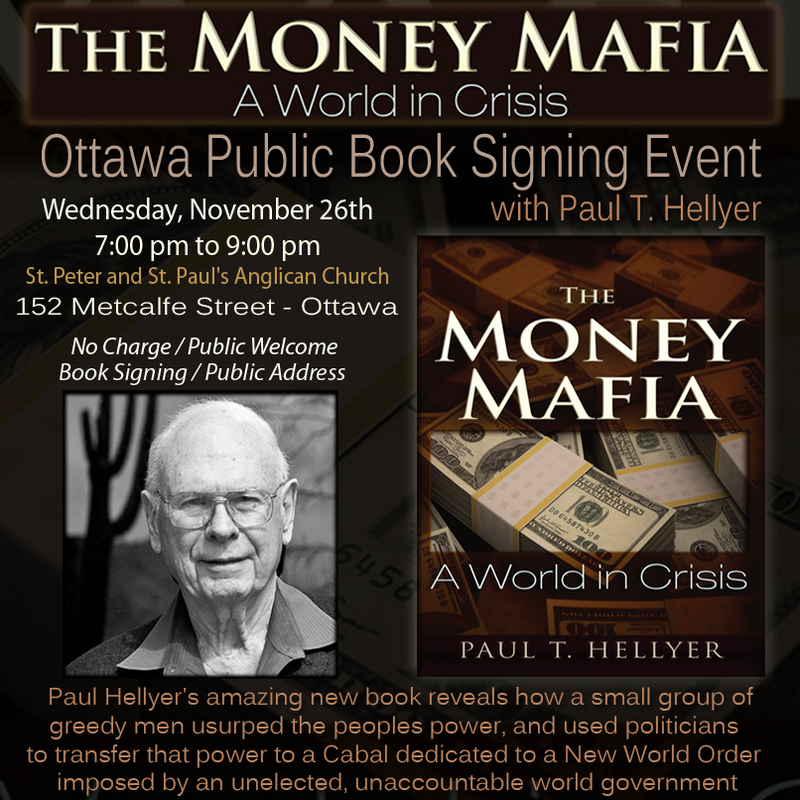 Paul Hellyer is one of Canada’s best known and most controversial politicians. First elected in 1949, he was the youngest cabinet minister appointed to Louis S. St. Laurent’s government eight years later. He subsequently held senior posts in the governments of Lester B. Pearson and Pierre E. Trudeau, who defeated him for the Liberal Party leadership in 1968. The following year, after achieving the rank of senior minister, which was later designated Deputy Prime Minister, Hellyer resigned from the Trudeau cabinet on a question of principle related to housing. 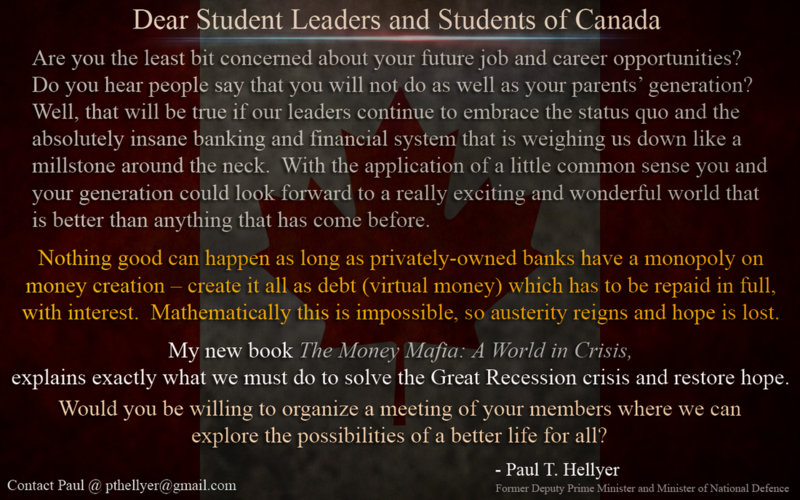 Although Hellyer is best known for the unification of the Canadian Armed Forces and for his 1968 chairmanship of the Task Force on Housing and Urban Development, he has maintained a life-long interest in macroeconomics. Through the years, as a journalist and political commentator, he has continued to fight for economic reforms and has written several books on the subject. A man of many interests, Hellyer’s ideas are not classroom abstractions. He was born and raised on a farm and his business experience includes manufacturing, retailing, construction, land development, tourism and publishing. He has also been active in community affairs including the arts and studied voice at the Royal Conservatory of Music in Toronto. 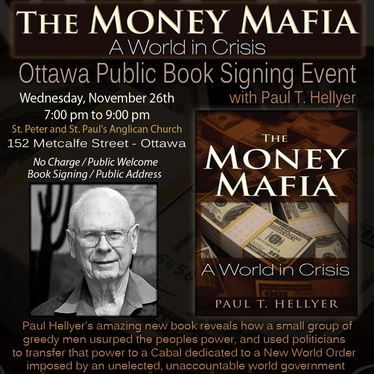 His multi-faceted career, in addition to a near-lifetime in politics, gives Hellyer a rare perspective on what has gone wrong with world economies.